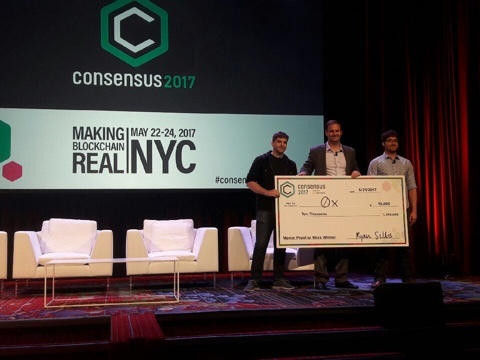 0x (pronounced “zero-ex”) took the top prize today during the second annual Proof of Work pitch competition at CoinDesk’s Consensus 2017 conference in New York. The startup is building a protocol to be used as a standard for the decentralized exchange of ERC20 tokens in the ethereum network. ERC20 tokens are a class of tokens that adhere to a set of standards dictating their implementation in ethereum-based smart contracts. As it stands today, virtually all tokens on the ethereum network now qualify as ERC20. Will Warren, 0x’s co-founder and CEO, made his pitch earlier this afternoon to Rumi Morales, the executive director CME Ventures; Dan Morehead, the CEO of Pantera; Brad Stephens, co-founder of Blockchain Capital; Matthew Roszak, co-founder of Bloq; and Lisa Cheng, a founder at Vanbex Group. Decentralized token exchanges already exist on ethereum, but they are all incompatible with one another, Warren said during his pitch. The 0x protocol, he argued, is a building block that envisions a greater degree of interoperability between multiple applications. 0x’s victory comes with a $10,000 check – along with the blessing of the panel of judges. The startup was one of six finalists to take part.